Although William Van Horne never owned Dominion Hill, he is an important historical figure in this area. He maintained a home on Ministers Island about 15 minutes from Dominion Hill. This area is now a Provincial Park and is a lovely place for our guests to visit during their stay at Dominion Hill. 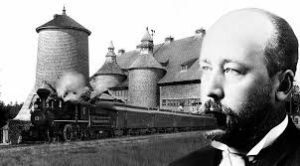 A descendant of Dutch ancestors who came to North America in the 1630s, William Van Horne was born in the US where he got his business training as a young adolescent while working for a variety of railroads in the mid-west in the era of the completion of the transcontinental railroad in America (1869). Rising through the ranks of the various railroads, he accumulated knowledge and skills that made him a perfect candidate to become general manager of the Canadian project to build a transcontinental railroad from Montreal to the Pacific – a project that he completed in record time. Due to his extraordinary achievement, he was ultimately named president of the Canadian Pacific Railroad after its completion in 1885 when the final spike was driven. Over the years Van Horne was a director of at least 40 companies and he invested in many more. These investments, along with the CPR and his Cuban interests, made him an exceptionally wealthy man and one of Canada’s most prominent capitalists. Despite his weak complaints that his purse could not match the resources of some of his CPR associates, Van Horne enjoyed his luxuries, including drink and cards (he could outlast his contemporaries at both). The most visible marks of his affluence were his massive home on Rue Sherbrooke in Montreal; his Cuban estate and Covenhoven, his summer home on Ministers Island, N.B. ; and his substantial collection of art. “In his time on the island Van Horne practiced his skills in the arts being both an excellent violinist and a painter in his own right. In addition to being a great patron of Canadian art, Sir William owned one of the largest private art collections in Canada.” His original paintings are on display in his cottage on the island. “Sir William C. Van Horne liked big things: … This passion for bigness, complemented by a usually keen eye for detail, was matched by exceptional energy, vision, and enthusiasm which made it possible for Van Horne to achieve or obtain many of the great things he so prized. His interests were numerous and varied, but construction of the CPR was his greatest contribution to Canada. As a railway man, he had many rivals. Others were more successful as financiers, promoters, and lobbyists, but none equaled his achievement in the building and operation of integrated systems of railway transportation and economic development, first in Canada and later in Cuba” (1). 1843 born on February 3 in Chelsea, Illinois to Mary Minier Richards and Cornelius Covenhoven Van Horne, lawyer and farmer. He was of Dutch, German and French ancestry. 1854 his father died when William was 11 years old, leaving the family in difficult financial circumstances and forcing William to seek odd jobs. His search for work led him to the local telegraph company where he learned the principles of the trade. 1857 he ended his formal schooling at age 14, failing to return to school after being severely beaten for sharing his unflattering caricatures of the principal. From this point forward William quickly advanced as a telegraph operator with a succession of railroads, acquiring increasingly responsible positions as he moved from the Illinois Central to the Michigan Central and on to the Chicago and Alton. During this time, it is reported that he was an avid student of railway operations, striving to learn everything he could; “apparently he could decode telegraphic messages by simply listening to the clicks rather than recording and reading them.” In addition to his keen mind and industrious nature, he had a “mischievous sense of humor” and a “propensity to play practical jokes” – characteristics that remained with him throughout his life. Through mergers and transfers, Van Horne rose quickly within the railway system. 1864 Chicago and Alton train dispatcher. 1868 Chicago and Alton superintendent of telegraph. 1870 Chicago and Alton superintendent of transportation. 1874 general manager of Southern Minnesota Railroad, later becoming its president. 1879 returned to the Chicago and Alton Railroad as general superintendent. He later assumed the same position with the Chicago, Milwaukee and St. Paul. 1881 appointed general manager of the Canadian project to build a transcontinental railroad from Montreal to the Pacific. This project was slated for completion in 1891; however, Van Horne’s “driving leadership and formidable organizing ability” brought the project to completion in 1885 when the final spike was driven on November 7that Craigellachie, B.C., by Donald Alexander Smith. 1888 he was named president of the Canadian Pacific Railroad, a position in which he continued to make marks of success by showing early profits, initiating further construction, and developing auxiliary services such as a shipping fleet. 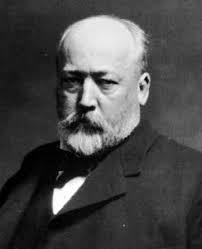 1899 at age 56, Van Horne retired from the CPR due to failing health from bronchitis; however, he continued to serve as chairman of the board and member of the executive committee. 1901 Van Horne had a very active retirement, building a railroad in eastern Cuba. 1908 he finished building the Guatemala line which had been under construction since 1903. 1910 he assumed full retirement from the CPR. 1915 William died on September 11 in Montreal.